The curved displays on new smartphones coming from Korea were the target of a joke by Foxconn Technology Group’s CEO, who mocked the products as phones designed to fit the rears of consumers. “People are talking about, wow, displays that can transform, but they forget that you have to be able to use the device,” Terry Gou said at the company’s shareholders’ meeting on Wednesday. Both Samsung Electronics and LG have come out with smartphones built with curved screens, but Gou is less than impressed with the technology. The Taiwanese manufacturing giant assembles Apple’s iPhone and also competes in building TVs. Gou recounted visiting the show booth of one of the Korean companies, where he asked the sales reps why the curved displays were needed. It’s not the first time Gou has taken a job at his Korean competitors. 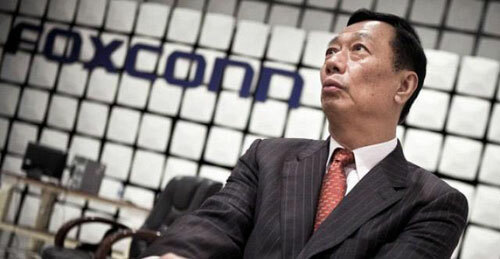 He has reportedly vowed to beat Samsung in the display business. Powered by Wordpress, enhanced with jQuery. Icons courtesy of Komodo Media.